The leaderboard below shows how the people of 1014 stacked up against one another: who received the most retweets once the battle was finished (midnight, 23rd April), and the list of Twitter followers on that person’s side. Thanks to all the retweeters who played the Game of Tweets! Each time someone retweeted one of the people from 1014 in our Twitter retelling, they were added to a Team List and their retweet was counted towards that person. For example: If you retweeted a tweet by #Gormlaith, we added you to the ‘TeamGormlaith’ list, and your retweet counted towards her tally. Followers joined as many teams as they wanted to, simply by retweeting the tweets of the person whose side they wished to join. Followers could remove themselves from a team list, by sending @1014Retold a tweet with the hashtag #changingsides. 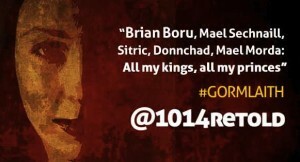 @jonskol wins a limited edition framed print of a person/quote of his choice from 1014Retold. Congratulations!